It’s time to pack in the carefree spontaneity of summer holidays; the late easy mornings, the casual wardrobe and lenient house-tidy rules. It’s back to morning alarms, military precision get-ready routines, homework and sport; it’s back to school! For less stress and mess, organisation is important. Not only does it make mom and dad’s life easier, consistent routine and order gives children a sense of security, and allows them to remain calm and to get to school with a clear mind, ready to focus. 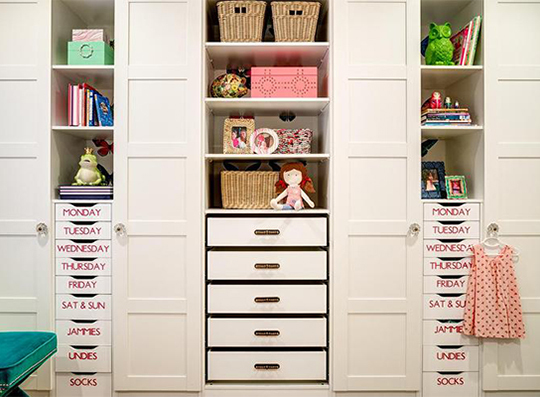 Create lables for your child’s wardrobe shelves and draws, telling them exactly where to find what they need. Make it easier by adding simple pictures alongside the wording on the lable. This will reduce the amount of unpacked clothing strewn across the floor, and save valuable time in the mornings. Hungry children can hit a kitchen like a tornado, draws are opened, cupboards ransacked and fridges emptied, and in their wake, a mess! By having a lunch-time or snack cupboard stocked with ready-to-eat healthy food, you can control what they eat and the mess they leave behind. Add fresh fruit daily, or have the same system set up in your refrigerator. After school sport, children are tired and often moody. The first thing they want to do is discard the load they’ve been carrying all day. The last thing you want however, is to argue about sport bags, sport equipment, and shoes being dumped in doorways and passages. Create a practical storage station in the garage or at the entrance of your home that has designated storage for all these items. If space does not allow for that, use the space under your child’s bed for storage of big items such as cricket bats, hockey sticks, balls etc. This will help keep your home tidy and peaceful! Create an area in your home that children can use to do their homework. If possible have this in their bedrooms where they can escape the noise and business of the home. 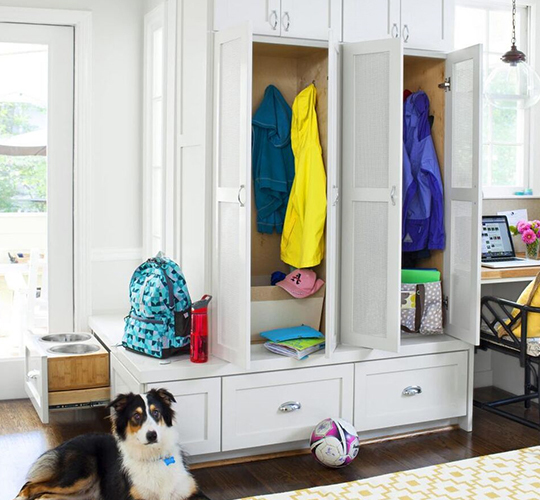 Consider incorporating this into their built-in wardrobes to save space and provide storage for all their stationery, arts and crafts goods and even a mini-library. For older children, ensure there is a ready power supply for the computer. Ensure you the cabinetry is made from strong material that will not easily crack, break or splinter, and can withstand climbing tots. Check that the cabinetry is environmentally safe. Superior’s products are E1-rated; made using raw materials that have low levels or urea formaldehyde. Formaldehyde is a resin used in the manufacture of many wood-based products. High levels of formaldehyde release a gas that can irritate the skin, eyes, nose and throat. Position cupboard handles low enough for children to be able to open and close their own wardrobes, giving them no excuse to not keep things looking tidy. 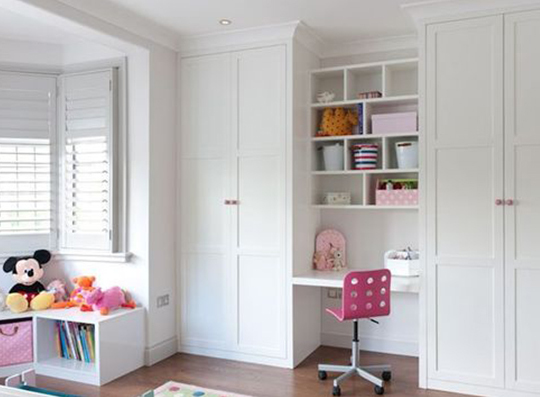 Design their bedroom cupboards so they cater for children as they grow. Install low hanging rods that can be raised as the child gets taller, store regularly used items on the lower shelves and draws so they won’t need to climb on chairs or other items to reach what they need. Have some fun. Use Superior’s chalkboard finish on cupboard doors or draw fronts to lable, or leave sweet messages encouraging young children to look after their stuff.